A true one-of-a-kind piece of art, the Eternal Bloom contains your loved one's ashes encased in the flower petals. Your choice of blue, red, yellow, green, purple, pink, pulsar or light aqua jewel tones sets the overall color of the flower which is attached to a green glass stem. Once your order is placed, you will receive a packet with instructions on how to send a small amount of your pet's ashes directly to the artisan who will then make your special flower. 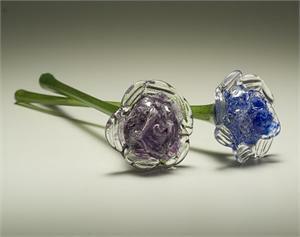 Etching of up to 10 characters on the stem is available for an additional fee. Please allow up to 8 weeks to receive your special remembrance. Would you like to have stem etched?